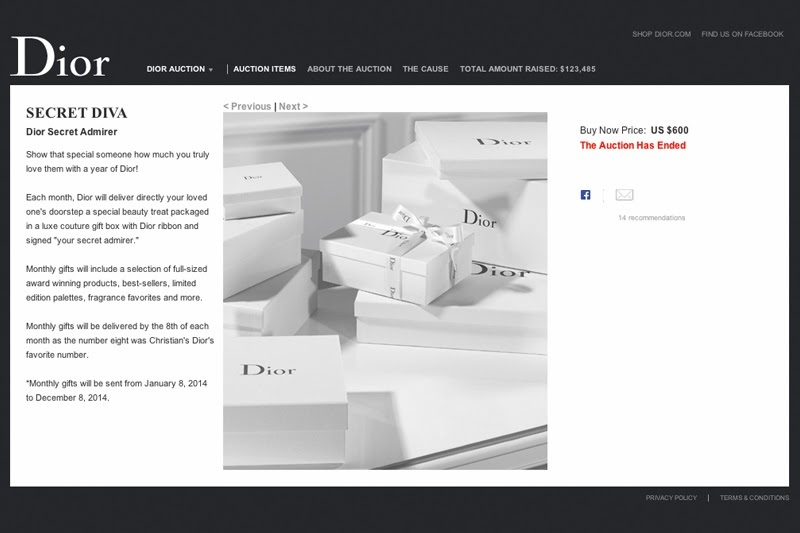 Every year, Dior holds an online auction with 100% of the proceeds going to charity. I am not sure if the charitable organization changes every year, but the proceeds from the 2013 auction went to Look Good Feel Better, an organization "dedicated to improving the self esteem and quality of life for people undergoing treatment for cancer." The Dior auction is held once a year and it ran from October 1 to October 10 in 2013. I learned about the auction from a fellow YouTuber, likesthelook, who purchased the 2013 Secret Admirer subscription in 2012. She did several unboxings on her YouTube channel if you want to get an idea of the types of products included in the subscription. 1) Secret Diva Subscription. This service provides you with 12 Secret Admirer boxes, one for each month of the year in 2014. This service is intended to be gifted to a loved one (hence, Secret Admirer), but I just bought it for myself. Products can range from skin care to cosmetics to fragrances. Dior is expensive and this subscription is no exception. The auction priced the 2014 Secret Diva subscription at $600. You are not guaranteed a value in each box, but judging from some of likesthelook's unboxings, there are a number of months where the value of the product exceeds the monthly "price" - in any event, 100% of the proceeds go to charity so I view the price tag as a donation and I am not too concerned about the value in each box. There were a limited number of subscriptions available but I don't recall how many (I made my purchase on October 5 so they don't seem to sell out too quickly). 2) Polished Diva Subscription. This is a nail polish of the month club that runs for the 2014 calendar year. The auction priced the 2014 Polished Diva subscription at $250 and there were 15 subscriptions available for purchase. I was pleasantly surprised when I received my first 2014 Polished Diva box on December 30! It was shipped via FedEx and the box was rather large considering there was only a letter, a small gift bag, and a nail polish inside. The January polish is part of the 2014 Spring Look Collection: Trianon. I received 204 Porcelaine, which is a limited edition shade. It's a lovely baby blue. This is my first Dior nail polish so I am very excited to try it! As you can see, these Dior subscriptions were very expensive, but I felt alright about the price since all the proceeds went to charity. Plus, I was below budget on my charitable donations in 2013... so I used this fact to further justify the purchases. 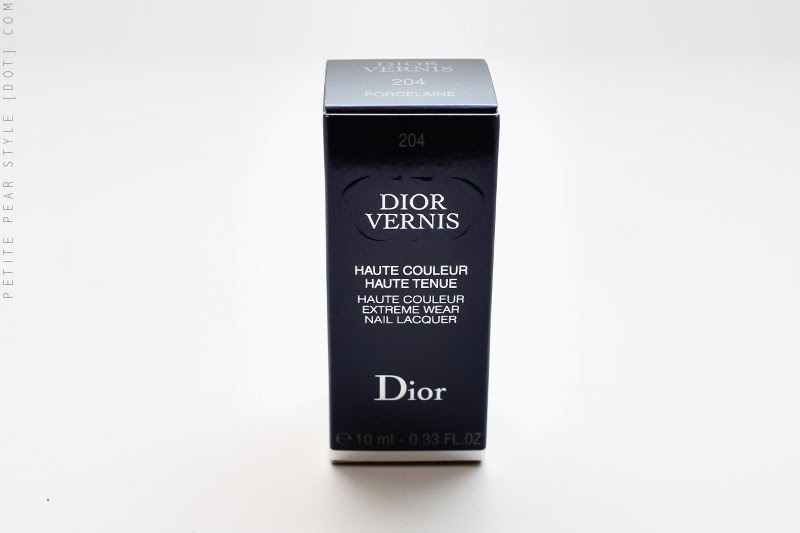 :) I will be doing video unboxings for all the Dior boxes, but I am going to do them quarterly. In the meantime, if you are interested in what I receive on a monthly basis, I will be posting the contents on this blog, on Instagram, and on Tumblr. 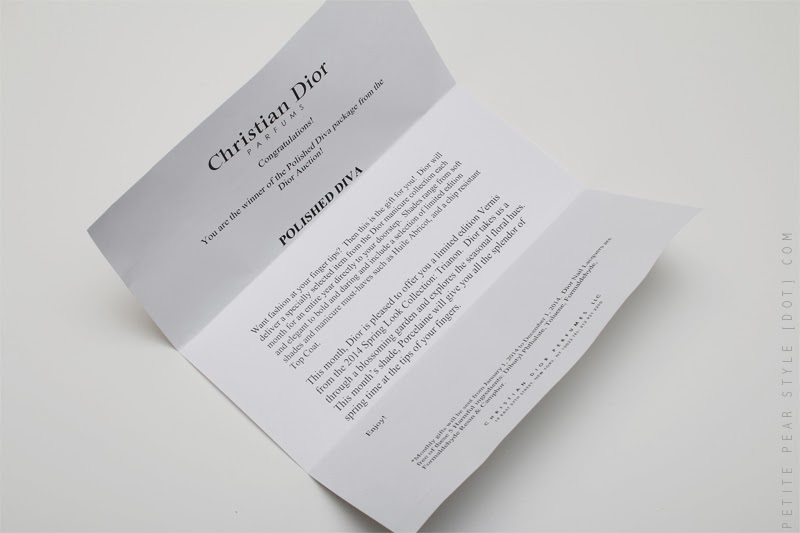 Overall, the 2013 Dior auction raised $124,000 for Look Good Feel Better. i really like that all the money goes to charity! that definitely factored into my decision to purchase these subscriptions! Hopefully, I can wait the nine months to buy this subscription. The products are so appealing. it's an interesting subscription for sure - i'm excited to try out the products as i don't have a lot of experience with dior! yes you did!! :) it's a great polish but i have to work on my technique as it took me 4 coats for opacity!! Dior polishes are really nice! I used to buy tons of them when they were under $20 and the Bay still had bonuses years ago. Now that Dior has mostly limited polishes and the price is quite high, there is another brand that I like from Switzerland instead that has pretty much the same shades. The Dior secret admirer boxes look like fun though. Have you received your July box yet? yes! in july, i received the manucure transat in captain for the polished diva subscription and the Dior Addict It-Line (liquid eyeliner) for the secret diva subscription.